There is perhaps no other fruit that deserves its own cookbook (or many cookbooks) then the apple. Think of apples in myth and folktale to the painstaking work done to nurture new varieties – not to mention the versatility of apples in recipes from sweet to savory – and there seems to be no end to what this humble fruit can inspire. (Apple computers, Apple Records, Gwyneth‘s daughter, Apple …the list goes on and on). Since it is apple season in much of the Northern Hemisphere (and apples do store well) it is always time to think about eating an apple. 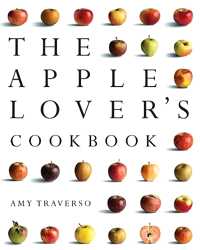 Amy Traverso‘s apple obsession has led to a very enjoyable cookbook, The Apple Lover’s Cookbook (Norton 2011). You don’t have to be as enthusiastic about apples to appreciate this book. She starts with a history of apples and then a guide to the 59 Great Apple Varieties with stunning photos by Squire Fox starting off with Ambrosia and Arkansas Black (p. 31) and finishing up with Zabergau Reinette (p. 60) . The guide will help you chose the right apple for the each recipe. The apple recipes start with Soups and Starters like Chicken Liver Pate with Apple (p. 81) flavored with Calvados or applejack and Sweet Potato, Apple, and Ginger Soup (p. 85) with fresh cider. Apples go so well with other autumn fruits and vegetables. Like Parsnip-Apple Puree (p. 103), Squash Stuffed with Apples, Pancetta, and Walnuts (p. 114) and Sweet Potato-Apple Latkes (p.117) . These are the kind of side dishes that would help make any meal a celebration of the harvest. There is a whole chapter on Poultry, Meat, and Fish Entrees, but who wouldn’t turn to the chapter on Pies, Crisps, Cobblers, Buckles, and Betties first? There are various recipes for traditional apple pies and French Tarte Tatin (p. 203) and a very pretty, easy Free Form Apple-Pear-Cranberry Tart (p. 204) that would please everyone for Thanksgiving. There is even a recipe for Williamsburg Wrapples (p. 217) a kind of portable apple pastry. The Apple Lover’s Cookbook is a very pretty book. Before you go on your annual apple orchard visit to pick up a bushel, get a copy and read the history of apples with the kids. They will treasure each one, and you can try out all these new recipes. In a medium bowl, combine the yogurt, 3 tablespoons of the honey, the lemon juice, vanilla, cinnamon, and ginger. Stir together and taste; add more honey if you prefer. Transfer to a bowl and serve on a platter with apple chips.